Hi, my name is Terry Thrift. I'm a teacher/performer in the Jacksonville area. I frequently play from as far south as St. Augustine, FL to north of St. Simon's Island, GA. I play a variety of events including weddings, corporate events, dinners, birthdays, and anniversary's. 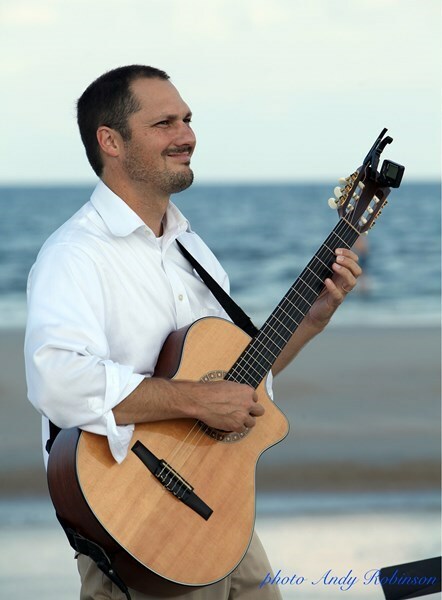 MY GOAL is to provide you with a stress-free booking/musical experience. I play a variety of styles to fit your event. Upbeat music for dinner parties, beautiful classical or pop for weddings, or jazz for folks to chat over. Check out my audio/video promo. I would appreciate the opportunity to provide music for you! Terry is a stellar professional and performer -- a genuine pleasure to work with, and recommended with enthusiasm. We hired Terry to play for our wedding reception, and he coordinated the hiring of an additional musician (violinist) at our request to achieve the exact sound we wanted. Terry took care of all the details and spared us the additional stress (much appreciated when planning a wedding/event). The business end of things was simple, and the performance was flawless. Sincere thanks to Terry (and Robert), and our greatest endorsement to those who may be considering. Terry performed at our daughters wedding and did a fabulous job!! He plays the guitar beautifully and can play a wide variety of music. He was also very personable and accommodating with our requests. I would highly recommend him to anyone needing an acoustical guitarist. Terry was so accommodating on such a hectic day. Music was great and everything went better than we could have ever imagined. Highly recommended. He was incredible. The music was awesome and I will use him again and again. Terry was extremely professional from start to finish. He was very friendly and communicative. The music he played was exactly what we wanted and it sounded great! I would recommend him to anyone looking for a talented musician to play beautiful ceremony music or acoustic easy listening at cocktail hour. He was great. Very easy to get a hold of, did exactly what was requested of him. He is incredibly talented. Him playing the guitar in the garden for my sister's wedding ceremony and cocktail hour was the perfect way to set the romantic mood. My husband and I hired Terry to play at our wedding ceremony. He made everything so easy and he was amazing to work with. He did a great job at the ceremony and he is an amazing guitarist! We engaged Terry for our wedding ceremony and was amazing! Everyone remarked on how beautiful the music was. My cousin, a trained jazz guitarist, was very complimentary of Terry's skills and sound. It set the perfect tone for our wedding and we could not have asked for anything better. On top of a great performance, Terry was extremely easy to work with during the planning process. I would strongly recommend him to anyone seeking a talented, experienced professional with a broad repertoire. I would highly recommend Terry Thrift to anybody who is looking to have live music at any event! He did an amazing job from start to finish. He was extremely professional and thorough leading up to his live performance. Please note Terry Thrift will also travel to Orange Park, Neptune Beach, Atlantic Beach, Jacksonville Beach, Kings Bay, Callahan, Ponte Vedra Beach, Bryceville, Yulee, Middleburg, Doctors Inlet, Green Cove Springs, Fernandina Beach, Penney Farms, Saint Augustine, Macclenny, Hilliard, Glen Saint Mary, Saint George, Saint Marys, Lawtey, Kingsland, Raiford, Starke, Bostwick, Elkton, Folkston, Florahome, Keystone Heights, Sanderson.